Have you worn B.Balenciaga perfume yet? If not, then let me share with you my thoughts about this fragrance. I got this B.Balenciaga perfume set like a welcome-finally-home kinda gift (LoL) from my husband with those Red roses that I posted on my Instagram other day. 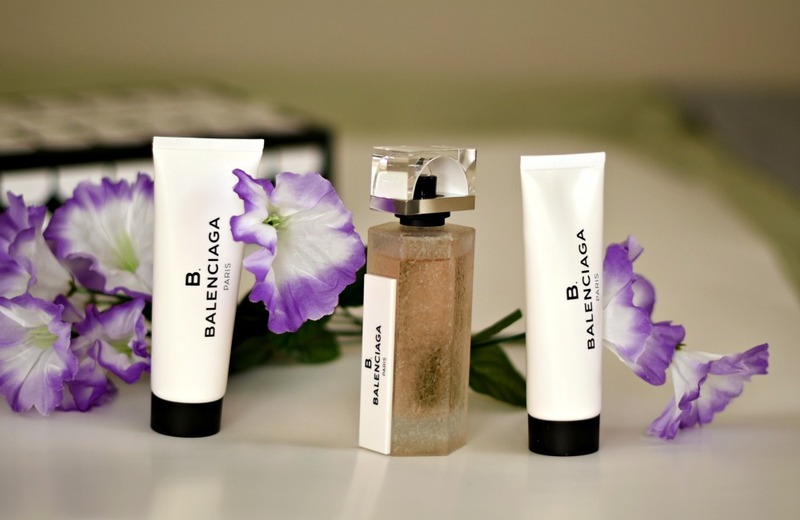 This set includes a Balenciaga full-size perfume, a body lotion and a shower gel. According to the label, "B.Balenciaga Eau de Parfum is a sophisticated, sensual and feminine scent that paints a portrait of a woman unveiling her most essential self. Base notes:__ Ambrette seeds, Cashmeran wood"
This is a green and fresh floral perfume that is perfect for everyday use. It starts with a refreshing floral notes that later become crisp green notes, but you can still smell little bit of those floral notes as well as a little woodiness. What I like about this perfume is that it doesn't give me a headache first few minutes after applying it, like some perfumes do (like, BVLGARI 'Pour Femme" __ you can read about it __ Here.) And then, I rely like the mix of Violet leaf and Lily of the Valley notes, probably those are my favorite notes in this perfume. Lasting power is good enough, at least 6 hours. And just look at the bottle __ isn't is gorgeous. Its frosted glass has a unique crackle texture, even the cap of this bottle is stunning with its unique arch. 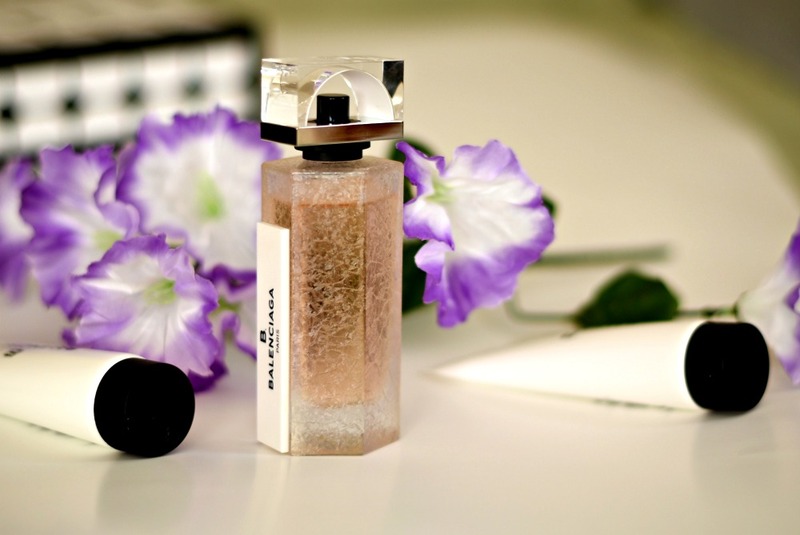 Overall, B.Balenciaga is a nice, fresh and feminine perfume that's not overpowering. It's sophisticated and kinda comforting scent. It can't be my signature scent, to be honest, because it's not memorable scent (like Thierry Mugler 'Alien' or Lancome ' Hypnose', Hermes 'Eau de Merveilles' and many others) but it's definitely enough to enjoy wearing, especially in summer, to give the humid weather some Spring freshness. Yum, I bet this smells amazing! This sounds like such a great fragrance, plus I love the bottle! I've never smelt it before, so I'll definitely be checking it out the next time I'm shopping around for a new scent, thanks so much for sharing and I hope you're having a great days far! Amazing products! Love this! Thanks for sharing! I should try! I've been wearing the same perfume for years but it never stays on very long. On the hunt for a new one! So good.. thank you for sharing! I really like your blog, let me know if you would like to follow each other! This sounds like a lovely scent! The bottle is so pretty too. Love the perfume too and the bottle is super cute! Now I am curious to try this perfume! The notes in this perfume sounds absolutely lovely, Nina! I also love the packaging. Great review dear! Love the packaging! 💜 ... The scent seems to be really good! :) Need to check it out! Love this review! Great post! I need to try this fragrance!! Wow. The pictures are stunning. Can't wait to try it and I think those florals are gorgeous!! love the smell! ♥ one of my favs! Very feminine and chic! I've heard of this but haven't tried it yet. Fantastic review! How thoughtful of your husband! I love a good perfume, I want to try it now! Balenciaga is a good designer and the perfume is no different but amazing, the smell and the packaging is amazing!! Cool review Nina! You made me curious about the scent! Have a great weekend!